Woldemar Bargiel was born in Berlin as the son of piano teacher Adolph Bargiel and Marianne Tromlitz. His mother had been married to Friedrich Wieck and Clara Schumann was his half sister. They were close during their lives and Clara introduced him to Robert Schumann and Felix Mendelssohn. 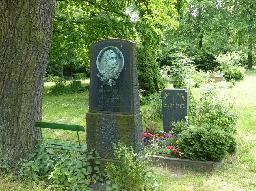 He was educated at home and by Siegfried Wilhelm Dehn in Berlin. In Leipzig he studied with Moscheles and others. In 1850 he returned to Berlin where he worked as a private teacher. After Clara and Robert Schumann helped him publish some of his compositions he was able to obtain positions at the conservatories in Cologne and Rotterdam. In Rotterdam he met Hermine Tours (1845-1911), the sister of the composer Berthold Tours. At first she was his pupil, but in 1870 he married her. He moved back to Berlin to become a professor at the Hochschule fur Musik. Among his students there were Paul Juon and Leopold Godowsky. He worked at the Hochschule until his death in 1897 in Berlin. The grave of Woldemar Bargiel at the Dreifaltigkeitskirchhof II, Berlin.